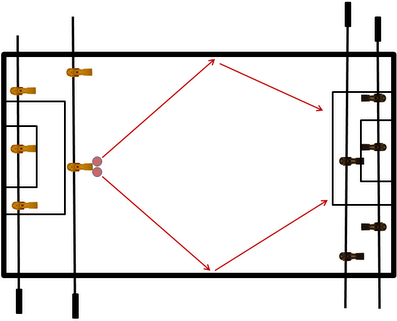 The bank shot is when you bounce the foosball off the wall at the proper angle in order to take a shot on the goal. This shot is primarily taken from the defensive side of the table, but it can be performed from both the defense and the offensive side of the table. It is typically more effective on defense because it can be set up without giving it away. The offensive bank shot has a more obvious set up that is easy to recognize when it is coming. The bank shot can be taken from either the offense or the defensive side of the table. Most often, it is used as a shot taken by the defense because it is harder for the opposing defense to detect when the bank shot is being set up. Also, there are many more effective and higher percentage shots that can be taken when you have the ball on offense. The offensive bank shot does have its place in the game and can be used as a surprise shot when an opponent is not blocking the near post. The diagrams will show you how to set up and shoot the angles for both the defensive and offensive bank shots. Make sure you do not have any lateral motion on the ball (don't move left or right as you come down to kick the ball) when shooting the bank shot. This will ensure a more accurate bank shot and teach you how to to hit the right foosball angle on the ball. Sometimes it is easy to tell if you are setting up an offensive bank shot because the ball has to be on the outside near the rails. Practice how to quickly get in position for this shot while you are passing the ball around in order to have the highest scoring percentage. Make sure your opponent is not blocking the near post when taking the offensive bank shot. The diagrams above will demonstrate the perfect foosball defense to shoot the bank shot against. Notice how the defensive 2 bar is guarding the near post? This opens up the foosball angle for the bank shot on offense.